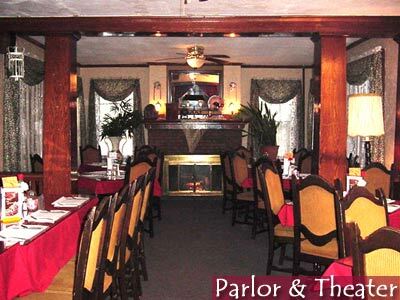 Poconos Best - Murder Mystery Dinner Theater Review. You never really know your spouse until after you've been married for a while, and even then�? I mention this because recently, after 3 years of bliss, I discovered my husband was a murderer. Certainly a fine surprise to shake up a Saturday evening out, don't you think? 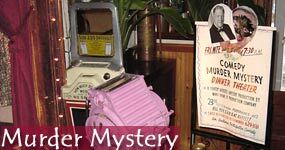 Truth is, I uncovered his "dastardly deed" at the very end of an exciting night thick with Agatha Chritie mystique at The Tannersville Inn's "Murder Mystery Dinner." From beginning to end, PoconosBest award winning owner and choreographer of "Murder on Demand" Bill Prall shrouded the evening with suspense--one heck of a feat considering he chooses his villain and supporting cast impromptu from the audience. And boy do the characters get into it; I hadn't any idea I was dining with the "murderer" the entire evening. The fantasy was liberating from the everyday hustle and bustle. Laughter and fond memories of a uniquely good time have us looking forward to a "repeat performance" in the near future. Want to "get away with murder? Just get in touch with PoconosBest at 800.807.3559 to attend a Murder Mystery dinner of your own.